Finding the right prop is easy! Easily buy your new low-priced prop! Just start typing characteristics about your boat's engine. You can type in horsepower, model name, liters, year, etc. Possible engine matches will be displayed below your search query. Keep typing to further narrow the list. Once you see the engine that most closely matches yours, select it using your mouse or the up/down arrow keys. Select the pitch & rotation of propellers you wish to see, then click "Find Prop"
Look on the outer hub of the prop near the blades or inside the hub. Most props are stamped with a series of numbers. Pitch is always the last number listed. Props spin either clockwise (standard or right-hand rotation) or counter-clockwise (counter or left-hand rotation). Most single engines use a standard rotation prop. Most twin engines use one of each. To determine what prop rotation you have, look at your prop as if on a boat. Position a blade pointing straight up. If the right-hand side of the blade is closer to the boat than to you, it's a standard rotation prop. 15 1/2x17 is not the propeller part number! Look around the inner hub or on the blades. Props are often stamped with both dimensions and a part number. Numbers similar to 15 x 17 are the prop dimensions (diameter & pitch). Those numbers are not your part number! Part numbers resemble 031018, 48-11320A40, 2231-103-12, etc. Volvo Penta DuoProps have a front and rear propeller that rotate back to back on the same drive. The front propeller is closest to the boat and hits the water first. DuoProps have both a counter and standard rotation prop to eliminate steering torque. The front prop is always counter rotation. The rear prop is always standard rotation. Volvo Penta DuoProps are each stamped with a size code (D2, F5, T9, etc) that is used to find a prop replacement. With this code you can replace either the front or rear pieces, or the complete DuoProp. Solas provides high quality at affordable prices. Better quality & higher-performance from constant improvement. Solas is the rising star in the prop industry. High performance aluminum and stainless steel propellers. Interchangeable hubs protect engines from shock & vibrations. The most durable hub system available. Michigan Wheel Propellers are the industry standard in excellence. 100+ years experience manufacturing propellers. Wide variety of styles and types. Quicksilver builds with precision and an eye towards performance. Improve your top-end speed and planning. Increased mid-range performance & hole shot with a new Quicksilver propeller. Stiletto designs for peak performance at all throttle levels. Superior knowledge means world class props. Lowest prices & the largest selection of Volvo Penta Propellers. High quality Stainless Steel and Aluminum propellers. We offer a wide variety of props specifically engineered for Honda Outboards. The highest quality Stainless Steel and Aluminum propellers. Take advantage of exclusive monthly prop specials for extra savings! Genuine Suzuki OEM Propellers for your Suzuki outboad motor. Why Buy Boat Propellers From iboats? Easily find a replacement boat propeller for your outboard, sterndrive or outdrive. iboats.com carries marine propellers designed for Mercury, Yamaha, Evinrude, Johnson, Honda, Suzuki, Tohatsu, Mariner, Force, Nissan, and Chrysler outboard motors. We also carry options for Mercruiser, Volvo Penta, OMC Sterndrive Cobra, and Yamaha stern drives. iboats.com has the largest selection of propellers anywhere. You'll find discount prices on all the top quality brands including Michigan Wheel, Solas, Turning Point, Stiletto Precision Propellers, Quicksilver Props, Volvo Penta QL and Original Factory DuoProps. These performance brands are available in 3 blade and 4 blade as either value priced aluminum or durable stainless steel props. With the most in-stock props available anywhere, you're sure to find the right size boat prop diameter and pitch, and in standard, right hand rotation or counter, left hand rotation. Do you know the part number of your old prop? Use the iboats.com Propeller Part Number Search tool for quick exact-matches on any propeller brand, including: Michigan Match, Vortex, Ballistic, Apollo, Hustler, Rascal, Express, Amita, Lexor, Titan, Saturn, Black Diamond, Thunderbolt, Torrent, Silverado, Lightspeed, or Typhoon propellers. Find blowout pricing on hundreds of discount options using the iboats.com boat prop calculator. As the largest online retailer of boat props, we often have manufacturers give us clearance props, inventory overruns, and other great deals. Shop now to find sales with free shipping and blowout prices up to 70% off. 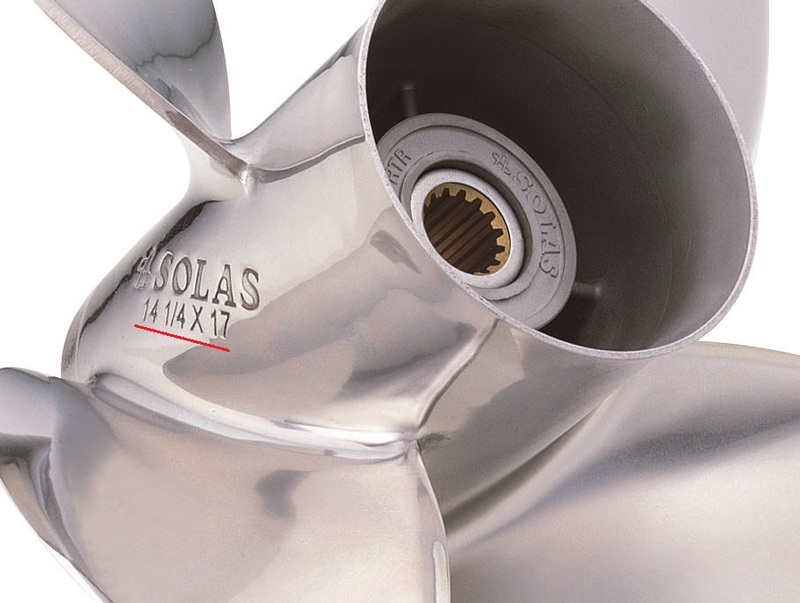 The optimum boat propeller for your particular application is one that will allow your boat's engine - with your normal load aboard - to develop full-throttle RPM within the engine manufacturer's recommended maximum RPM range. Every engine manufacturer states the recommended RPM range as part of the engine specifications. Damage to the engine can occur if a propeller that allows the engine to over-rev (attain a full-throttle RPM higher than the specification) is installed. Damage can also occur if the installed boat prop causes the engine to lug - not reach the minimum specification. Overall best acceleration and top-end speed will be achieved when your full-throttle RPM is near the midpoint of the manufacturer's recommended maximum RPM range. Outboard motors 30 HP and higher, and Sterndrives require the most attention to correct propeller selection. Smaller outboards come with an all-purpose size that meets most requirements. An onboard tachometer to monitor engine RPM is also commonly installed with the larger engine installations. Most boats are delivered from the dealership or factory with propellers that have been properly matched for the most common usage. Make note of the part number that is usually cast into the metal itself and you'll be able to order an exact replacement using iboats' Propeller Part Number Finder. The two important propeller dimensions that you'll need to consider are pitch and diameter. In most cases the boat propeller and engine manufacturers have pre-selected the diameter range needed for your engine. Your selection can be focused almost exclusively on pitch. Your vessel will respond to different pitches the way your car responds to different gear positions in your car's transmission. Moving to a higher pitch will result in a decrease in your full-throttle RPM, just like the effect when your car's transmission shifts to a higher gear. The reverse is also true: move to a lower pitch and your full-throttle RPM will increase. Most propellers are sized by two-inch intervals, example 17", 19", 21", etc, and a 2" pitch change will result in an average 300 to 400 full-throttle RPM change. It's always a good idea to keep a spare prop aboard, but here's a way to get double-duty from that investment. If your family is into tow watersports, it's likely that your vessel's performance can benefit from a change of 2" less pitch whenever you head out for a day of skiing. The improved acceleration will really be appreciated by the water skier you're pulling. Just don't forget to change back to your usual size standard prop on those days that you're out cruising. Most boat props constructed of either aluminum or stainless steel and utilize a softer hub material to protect your engine's drive train. Aluminum propellers are less costly, but more prone to damage. Stainless steel propellers are usually about 3 times more expensive than their aluminum counterparts, but far more durable. Some boaters also experience better overall performance with stainless steel because the material's tensile strength allows the manufacturer to cast the blades thinner. Diameter is the width of the circle that the propeller would make when rotating. Diameter is the width of the circle that the prop would make when rotating. The diameter can vary by up to 1/2" with no discernable change in performance. Caution: Before increasing the diameter of your prop, make sure there will be enough clearance between the blades and cavitation plate or anode on your engine. Diameter is the first number listed on boat propeller dimensions. Pitch is the forward movement of the propeller after one revolution assuming there is not slippage. Pitch is a measurement of how far the propeller moves forward during one full revolution. Most boats experience some "slippage" between the blades and the water. This means that the propeller does not advance the full distance of the design pitch during each revolution. The amount of slippage varies from boat to boat. Pitch is the second number listed in the propeller dimensions. The curved lip on the propeller helps get a better bite on the water. The design on many propellers includes a cup on the blade's trailing edge. This cupping or curved lip on the blade edge lets the prop grab the water more efficiently. Getting a better bite on the water reduces ventilation, slipping, and often allows for a better hole shot too. Cupping works very well where the motor can be trimmed, positioning the propeller near the water's surface. Rake describes the slant of prop blades in relation to the hub. Rake affects how water flows through the propeller and can impact the boat performance. Aft Rake helps to trim the bow of the boat upwards, which often results in less wetted surface area and therefore higher top end speed. Aft rake propellers also typically "bite" better on ventilating type applications. Forward, or negative rake, helps hold the bow of the boat down. This is seen most often on workboat type applications. Ventilation occurs when surface air or exhaust gasses are pulled into the boat propeller blades. When this happens the engine RPMs increase rapidly and the boat loses speed. Ventilation can be caused by tight cornering, a motor mounted too high on the transom, or by over-trimming the engine. Cavitation is a phenomena of water vaporizing or "boiling" due to the extreme reduction of pressure on the back of the propeller blade. Cavitation (which is often confused with ventilation) is a phenomena of water vaporizing or "boiling" due to the extreme reduction of pressure on the back of the propeller blade. Many propellers partially cavitate during normal operation, but excessive cavitation can result in physical damage to the blade surface due to the collapse of microscopic bubbles in the metal. Be advised disturbances in the water flow forward of the propeller can result in blade damage which appears to be blade cavitation, but is actually due to non-favorable water flow. We recommend 3-blade propellers for recreational boats with 3, 4, and 6 cylinder outboards and I/0 engines. 3-blades provide good "hole shot" and top-speed performance. We recommend 4-blade propellers for bass boats and those with high performance hulls running high horsepower outboard engines. Compared to 3 blades, 4-blade boat props provide better "hole shot" performance with less steering torque and less vibration at high speeds. When switching from 3 to 4-blades, generally a 1" pitch decrease is required. So, a 21" pitch 3-blade is replaced with a 20" pitch 4-blade. Pitch is increased when switching from 4 to 3-blades. Count the teeth on your prop shaft or inside the hub to determine spline count. Spline Count is an important factor in fitting a prop. They are the little teeth you see on your propeller shaft and inside the hub. The number of splines on the shaft and inside the hub must match for the prop to fit your boat. A Pin Drive application has no splines. The prop is secured to a smooth shaft with a pin through the shaft. Opposite-direction propellers on twin engines eliminate steering torque because the left-hand rotation balances out the right-hand rotation. Most single engines use a standard rotation. Most twin engines use one of each. To determine what rotation you have, look at your prop as if on a boat. Position a blade pointing straight up. If the right-hand side of the blade is closer to the hull than to you, it's a standard rotation. A boat with twin engines and two boat props spinning in the same directionats will have a lot of steering torque. Two right-hand (or standard rotation) propellers pull the stern hard to the right and the bow to the left. Using both standard and counter rotation with twin engines will eliminate the steering torque. This gives you better straight-Line tracking and helm control at high speeds. How does pitch and slip affect performance? Slip is the difference between actual and theoretical travel of the propeller blades through water. High slippage means that the boat is moving less distance for each rotation. This typically happens with boat props that are poorly matched. A correct fit will move forward about 80 to 90 percent of the theoretical pitch. What is the difference between Thru-Hub Exhaust, Over-Hub Exhaust, and Non Thru-Hub Exhaust? Thru-hub exhaust propellers are used on most outboard & stern drive engines. You have a thru-hub exhaust if there are exhaust holes on the engine gearcase around the shaft. Thru-hub boat props consist of a round barrel (the hub) to which the blades are attached. The exhaust passes through the barrel and out the back, without making contact with the propeller blades. This provides a good clean water flow to the blades, usually resulting in good acceleration and hole shot. Non thru-hub exhaust systems are found mostly on low horse power outboard and stern drive motors, and where inboard ski props are used. You have a non thru-hub exhaust if there are NO exhaust holes on the engine gearcase around the shaft. Over-hub exhaust propellers have the blades attached directly to the smaller tube that fits over the propeller shaft, eliminating the larger exhaust tube. These types are often used for attaining maximum top speeds. On some vessels, the hole shot can often suffer due to the extreme exhaust flooding that occurs around the blades during acceleration. Over/Thru-hub exhaust propellers are a combination of thru-hub and over-hub exhaust. This allows some exhaust to escape at lower RPMS, providing a controlled amount of exhaust flooding. These types will allow the propeller to be slightly easier to turn during initial acceleration, allowing for a better hole shot on some engine/boat combinations. Most pleasure boats are factory equipped with aluminum propellers. Aluminum is a great choice for small and medium sized boats. They are inexpensive and under normal conditions can last for many years. When boating in an area where striking the bottom is likely, aluminum blades can flex, helping prevent damage to your engine. Stainless steel boat props are ideal for large or heavy boats and those running in saltwater. Although more expensive than aluminum, stainless steel is more durable and will last longer. When running at speeds over 50 mph, stainless props will perform better than aluminum. Why do outboards with the same horsepower often need different prop sizes? The size of the boat propeller needed is largely influenced by the lower unit gear ratio. The stock gearing on outboards causes the shaft to turn slower than the RPM at the powerhead. Gear ratios, such as 12:21, are a measurement of the difference between the number of teeth in the crankshaft gears and the prop shaft gear. So, although the horsepower of two outboards may be identical, lower gear ratios use larger propellers and vice versa. How can you tell if your engine is running within the manufacturer's recommended RPM range? To check if your boat motor is performing within the RPM range recommended by the engine manufacturer you will need a tachometer. Many designs and styles of tachometers are available to help measure performance. Will a different propeller fix torque issues like listing and hard steering? The propeller is not typically the problem with steering issues. The usual causes are hull irregularities, steering system hook-up, or outboard engine mounting. Check the boat hull for any distortion that could cause a problem. Make sure that the steering system has enough adequate sized pulleys, is properly swiveled, and has the right steering cable tension. Engines that use right-hand rotation propellers should have the steering wheel on the starboard (right) side of the boat. The driver's weight offsets the tendency of this side to lift from torque action. Outboard engines must be mounted in the exact center of the transom and setting level. When a boat is underway the engine tilt should make the prop horizontal, otherwise it can have a pull to the side. Why does my outboard vibrate excessively when the boat prop hardly looks used? This is fairly common. Propellers that aren't showing any signs of impact may still have been damaged. Bent or distorted blades will cause the motor to vibrate even if the damage is indiscernible. Will a different sized prop help me troll better? Standard sizes, with a standard pitch, typically troll too fast. Throttling down to very low speeds causes the prop to overload, thus allowing the engine to idle faster. Lowering the pitch is always best for trolling. Use the lowest pitch possible for the best trolling results. Will a different sized prop help me in water skiing? Original outboard propellers are typically selected knowing the exact boat that it will end up on. So they are pitched a little high to prevent it from exceeding the top RPMs on a light boat. A prop change is usually a big benefit for water sports. The original equipment option tends to give poor speed, acceleration and performance when used on heavier boats or when towing a skier. This poor performance can make it more difficult for skiers to get up. Lowering the pitch or changing to a 4 blade propeller can improve hole shot. My engine came without a propeller, how do I know if I need a right or left-hand prop? Stand behind your boat and look at the prop shaft. If it rotates clockwise then you need a right-hand or standard rotation. If it rotates counter-clockwise then you need a left-hand or counter rotation. Should I change the propeller size on my sterndrive engine? Boat manufacturers typically run extensive tests on I/O boats to ensure that the propeller size performs well. However, if the boat displacement changes, due to the addition of heavy aftermarket equipment, you should consider a different boat prop. The diameter would remain similar to the original, but with a lower pitch. Should I change the propeller size if I boat on high elevation lakes? Gas engines produce less power when they are run at elevations above 3000 ft. Lowering the boat prop pitch will help keep the RPMs within the desired range. However, due to the lower air density, the engine will not have as much horsepower and the boat will have a slower top speed. Boaters who frequent high and low elevation lakes often use two different sized props to accommodate for their boating elevation. What is electrolysis and how does it affect my propeller? Electrolysis is caused by two distinct metals being near each other. A stray electrical current, from the boat or another source, causes pitting on the boat prop blades. Sacrificial anodes can help protect the prop, but the best solution is to find the source of the electrical current. Galvanic corrosion is very similar to electrolysis. However, galvanic corrosion occurs in salt water. The less noble of the two adjacent metals begins to corrode. Reduce the corrosion and pitting on your propeller by using adequate sacrificial anodes on your boat. Check your owner's manual or contact your dealer to find the manufacturer's recommended RPM range. For safety and efficient performance, make sure that your engine is running within the manufacturer's recommended RPM range. Matching the right prop for the load is the most significant factor of RPM adjustment. Changing the boat propeller pitch will increase or decrease the RPM's. Adjust the pitch so the RPM's fall within the recommended range. A 2" pitch increase (21" to 23" for example) acts like shifting a car gears up. It typically results in a 300-400 RPM decrease. Using your existing boat propeller or a new propeller, make test runs to determine the maximum RPM and boat speed. Vary the trim angle for optimum performance. If the actual WOT RPM's are above the recommended RPM range, install the next larger pitch option to decrease your WOT RPM. Re-test the WOT RPM. If the actual WOT RPM range is below the recommended range, install the next smaller pitch option to increase your WOT RPM. Re-test the WOT RPM. Keeping your RPM within the engine manufacturer's suggested wide-open-throttle (WOT) range is a key component in maintaining peak performance of your motor for as many years as possible. While there can be a variety of over-revving causes, the simplest and most common reasons will typically be propeller related, as not everything that fits the motor will work for the boat-motor set up, and propellers naturally lose their bite with the wear and tear accompanying standard use. For used propellers, there are typically 3 types of damage that can cause over-revving. The amount of over-revving and how quickly it changes from being within the manufacturers WOT ranges to being over can help clue you in to the problem. 1) Sudden & significant increase in RPM and full (or mostly full) loss of power is often caused by a spun hub, where the propeller itself is no longer moving at the full pace of the prop shaft. Depending on the propeller and your local resources, you may be able to have a new hub re-pressed, but typically you'll be in the market for a new propeller if it's not under warranty. 2) Sudden & significant increase in RPM and partial loss of power accompanied by heavy vibrations is usually the symptom of having done significant damage to your prop blades. A large "THUNK" should also help clue you in. In this case, you will be looking for a new propeller; a prop repair shop likely won't cut it. 3) Gradual increase in RPM (over months/years) is a common symptom of light to moderate damage done to the prop via dings and nicks usually caused by debris, sand bars, or rocks, and are the reason why most people use their aluminum props for less than 3 years. Often times you can milk the life of the prop by getting the edges resurfaced by a prop repair shop, though resurfacing costs should be compared against buying new. If you're over-revving on a brand new propeller, you're likely dealing with a prop with specifications that are not complementive of your motor, such as having too low of a pitch (not enough resistance = over-revving) or too small of a diameter (too much slip = over-revving). This can be a costly mistake since most retailers will not accept returns for props that have been run on the water, making it imperative that you pick the right propeller from the get-go. Alternatively, you could have a factory defect, which is typically a hub related issues, in which case you should contact the retailer or manufacturer for a return or warranty claim. How do I know which pitch I need? Unlike every other part on your motor, there is not a single part number that replaces your boat propeller. Three primary performance-changing attributes of the propeller can be changed/modified without preventing the prop from fitting. They are: pitch, blade count, material, and diameter (though after a certain point, diameter can affect fit). Making sure you get a prop that will not only fit the prop shaft but is suited to your application and context (boat style/size/weight, altitude, uses, etc) is a must when it comes to finding a replacement. If you're looking for a something that will simply replace what you currently have, the easiest way to determine the right prop for your set-up is in two parts: 1) identify the specs of your current propeller and, assuming you're satisfied with the performance, replace it with something with the same pitch, material and blade count. Diameter doesn't need to be identical but should be within 1/4" of the replacement's size. 2) Use our prop finder tool to navigate to a listings of propellers that fit your motor. So how do you identify your prop's pitch and diameter? Usually either or both will be stamped somewhere on the prop's hub or just behind one of the blades. The standard format of diameter and pitch for props is: pitch x diameter; e.g. a stamp that reads 14x17 would indicate a 14" diameter and a 17" pitch. Alternatively you may only see a number between 5 and 27 followed by a "p", which would be the pitch. Should only the pitch be available, you can easily get the diameter of the prop by measuring from the center of the hub to the tip of one of the blades, then doubling that measurement. If the pitch isn't stamped on the prop but you can find a part number, doing an online search for that part number, especially in conjunction with the prop manufacturers name, may lead you to the specs you need. Should you be unable to find any information on your current prop's pitch (for example if there were no markings, the prop is sitting at the bottom of the lake, or in the hands of thieves) there are a couple resources that can help you determine what approximate prop specs would serve you best, though none are guaranteed. Mercury Marine's Prop Selector is a tool that will suggest props/specs based on your answers to a series of questions about your boat, motor, boating habbits, and other relevant aspects that would impact optimal prop selection. Another potential resource is a local dealer that services your make of boat. Because altitude is a variable in determining pitch (rule of thumb: drop a pitch for every thousand feet you increase in elevation), it's common for boat manufacturers to leave choosing what pitch goes best with the boat/motor set-up to the dealer. This gives the dealer a solid understanding of the pitch ranges for most boat/motor set-ups in your area, allowing you to pick from that range based on your performance preferences. A third resource is other boaters with your similar set-up and at a similar altitude: what pitch, diameter, and blade count are they using, and what type of performance are they getting from it? If you don't want to spend your time pan-handling for information at the local marina, try our boating forums. Once you've determined the pitch and diameter you need, you'll need to find prop options that will fit your prop shaft. This is what our Prop Finder was created for: pick your manufacturer, model, pitch, then choose from a variety of props that will fit, using diameter, material, and blade count, and brand preferences to help narrow your selection. Props can take a beating in even the best conditions. Churning sand, mud, floating debris, logs and rocks can bend, chip or crack blades. Even minor nicks, dings or scratches that accumulate from normal wear-and-tear can rapidly degrade performance. Running a damaged or bent propeller has the same effect as driving on worn or poorly inflated tires-you have less control, and performance and efficiency suffer. Worse yet, continuing to use a bent or cracked prop can damage the engine's gearcase. 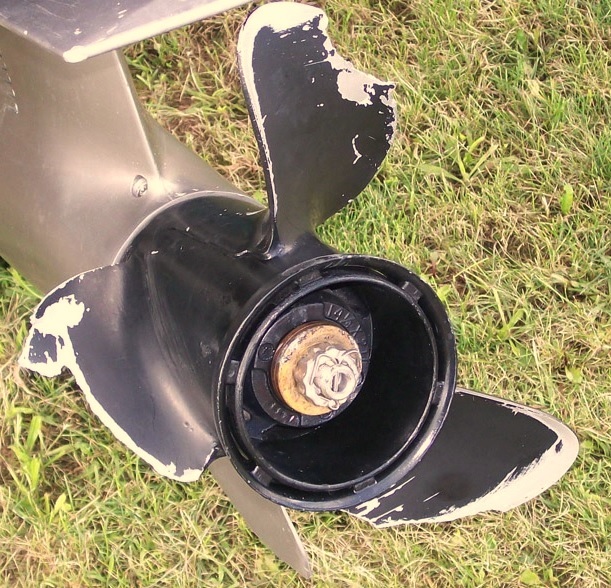 A compromised propeller will not spin true, creating excessive vibration that can have devastating results. With this in mind, propellers should be inspected regularly for damage. Spring commissioning and fall layup are great times for a close look. Trailered boats can easily be examined prior to each trip. Signs of severe wear, such as chipping or cracks on the blade tips or cracks along the blade joints are easiest to spot. Another important but less obvious item to inspect is the propeller's pitch, as the blade angles can become bent or offset over time. If propeller blades seem out of alignment, it's best to have them inspected by a local prop specialist. Apart from regular prop inspections, if while running the boat you hit something or tangle up in thick weeds, examine the prop as soon as possible. If you heard it or felt it, damage is highly likely. This is also why a spare prop should be an essential onboard piece of equipment. When prop damage occurs, the question is whether to repair or replace. Propeller repair can be expensive, especially on hard-to-weld stainless steel. Blades that are ground down to remove bent or chipped edges create subtle changes in prop pitch, cup and diameter that can degrade performance. And, few prop shops can guarantee same-day service, especially in the heart of boating season. This leaves you off the water. However, if the damaged prop has a removable hub, the housing can instead be replaced for about the price of a repair. Why repair a prop and contend with performance issues when a brand new one can be installed for a comparable price, putting you back on the water the same day? There also are good reasons to replace an older propeller that is still in good condition. Changes in hull design and the introduction of high horsepower outboards have led to radical new approaches to propeller design and manufacturing. In addition, computer modeling has resulted in a better understanding of fluid dynamics and high-velocity water flow. Advances such as variable rake and pitch blades, multiple geometries and new barrel designs have rendered older propellers obsolete in terms of hydrodynamic efficiency. Choosing the appropriate propeller for a particular boat and motor is fairly simple. The most important equation to understand is that less pitch means more rpm and more pitch means less rpm. For peak performance, an engine should run at the upper end of the manufacturer's recommended rpm range at wide open throttle, or WOT. If more speed, handling and lift is desired, particular prop styles come into play. The normal load on the boat, as well as whether the craft is usually used for fishing, watersports or cruising, also factors in prop selection. Turning Point's online Prop Wizard tool helps you select the best prop for your boat/engine set-up. To help keep your boat running its best, replacing a propeller is quick, easy and inexpensive for models with an interchangeable hub system. Any damaged blade requires only that the housing be replaced, not the entire prop, saving hundreds of dollars over the years. One question we get all the time is what do I need to do to keep my stainless or aluminum prop in optimum running condition. Other than not hitting something in the water, there is really not much to do. We always recommend removing the prop for overwintering, but that is to protect against theft and from someone hitting their shins on the prop blades when they get too close to your boat! General surface cleaning can be done to stainless if you want to maintain it's like-new shine, but even that is not necessary, A shiny prop is not measurably faster than one a little dulled by use. But it is critical any edge damage, dings, gouges, or bending of the blades be brought to the attention of a local prop repair specialist immediately. They have the tools and expertise to get your prop back in optimal condition. They are not so busy in the off season, so taking that prop for repair after your boat is tucked away is the perfect time to keep a local craftsman busy during the winter. Ron Bailey is vice president of sales and marketing for Turning Point Propellers. The company has been engineering, manufacturing and marketing high-performance aluminum and stainless steel propellers worldwide for over 15 years. Turning Point Propellers: 11762 Marco Beach Dr., Suite 2, Jacksonville, FL 32224.